...from winter in Norway to the balmy climes of the Indian Ocean! 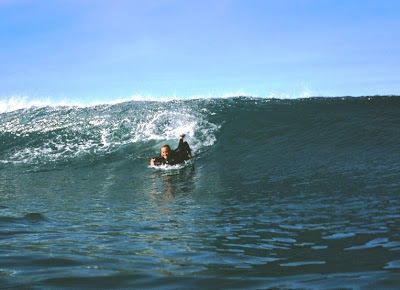 Mr. Dirk and I were surfing together a while back, and as I was paddling back after a ride, he executed a virtually perfect glide-in mat take off. It was a delight to behold! The rider aggressively kicks/paddles into position to catch a wave. As the wave approaches, he/she takes a few hard strokes towards shore, then stops paddling just before the wave reaches them. At that moment, they slide forward on the mat, into riding position. As the wave picks them up, their positioning relative to the cresting wave and their forward momentum due to the nose-ward slide allows them to catch the swell....and off they go, already in the right spot on the deck of the mat. After you practice this move, it's possible to catch waves further and further out before they break. Occasionally, we get emails from mat riders asking about inflation levels. Sometimes they're experiencing a touch of frustration riding their mat at the softer settings preferred by surfers like George G.
After riding the often powerful and disorganized conditions along the Central Coast of California for the past 7 months, I can relate to their predicament! The lower inflation levels (a 90 degree bend, or more) that work so well in point surf can be a liability in dumpier surf. If you're lacking the smooth, linear power line of a point break, riding a softer mat can be haphazard at best. Because so many factors go into the "correct" inflation level on a given day, it's important to keep in mind that the variable nature of a surf mat should be used to it's fullest extent. There are no hard and fast inflation rules! In point surf, I usually ride a mat which is bent around 90 degrees. But my experiences this winter on the Central Coast have resulted in a 45 degree bend most of the time. Meaning, a lot more air. 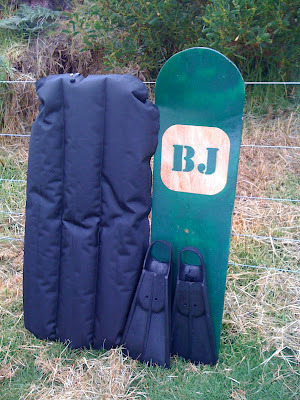 This is because, in the punchy waves I ride, I don't need the delicate skimming ability generated by a flatter mat. And the extra hold of a firmer mat helps me track across uneven, backwashy shorebreak walls with a lot more authority. Again, inflation is a personal choice...determined by your experience, mood and the waves you are immersed in. The correct setting is the one that works for you! Aloha from Hawaii. Right, well I've found out firsthand that Molokai is definitely not surf mecca. Which is a blessing these days. Luckily, every real surf spot is scary and treacherous in one way or another. I've yet to see a perfect wave without either the wobbles or lurking nasty hazards. I have had some good rides but no real tubes or flawless peelers. The surf so far is a bit random because this island's waves generally break over jumbled rocks and chaotic lava flows. There is one deadly four mile beachbreak but no classic points. The name spots are on risky reefs with a few having sandy shorepounds inside. I'm generally intimidated by the dangers, have had some really fun go outs, and also some frightful hold downs and reef inspections. Massive 20'+ tiger sharks patrol offshore. Powerful currents abound because tradewind swells race along both of the long sides of the island. Small days are easier, but the waves are usually still unpredictable and distorted. It's fun but challenging, with a fair bit of staunch localism to cope with as well. I won't even go out at the heavy local spots because they are just that. 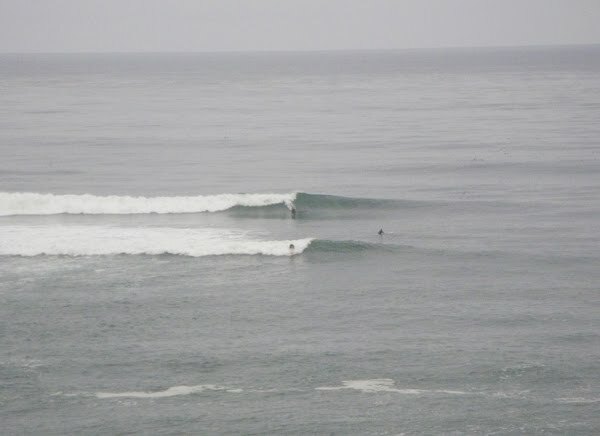 They can see Maui, with it's thousands of surfers just a few miles away, so often it's not advisable to go out at the core breaks unless you are are invited. The two breaks at the mothballed hotel on the west end, Babies and Boilers, are fairly safe and playful, mushy fun that is open to all, and therefore the most popular surf beach, except that summer is usually dead flat on that coast. Out of the way spots exist, and can get good, but most are quite are fickle due to intense winds, and swells can be shadowed by nearby islands. Plus, only half of the coastline is accessible by land. 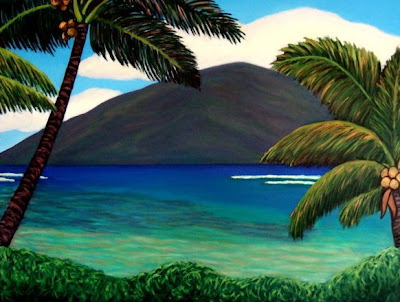 As a surf destination Molokai is mediocre. As a friendly, behind the times place, definitely. Because there are few attractions and no upscale establishments, Molokai is an undeveloped environment that suits just being happy (if you follow the local rules). Put on your smile every day, make a quiet entrance, accept what you are offered and strive to give something back. Show respect always, be courteous about eye contact. When meeting people, make it known who you are, where you are from, and when you're leaving, then give appreciation for whatever transpires. True island style requires acceptance, compassion, sharing, humor, warmth, coolness... Aloha is a state of mind, as it doesn't matter who you are, as long as you have the Polynesian vibe. Polynesia has a lot to teach the world. Poly meaning many, and nesia implying interwoven island nations. This name for the peoples of the tropical Pacific seas does indeed serve to evoke an image of one mega-tribe, from Canada to Australia, united by following the same basic principles of what we outsiders know as aloha spirit. Molokai's population is still around 50% Polynesian, so there's lots of aloha, and a strong will to keep things the same. Anyway... Get over here (and follow the above) because it will help the locals to continue with their jobs and businesses due to your tourist dollars coming in. No one will resent you if you don't try to take over anyone else's trips. And there is surf, but don't have overly high expectations. BTW, just about every paying job on the island is immediately taken by Molokaians, and the town near to where I'm living on the west side has the highest rate of unemployment in the state, which actually appears to be another good thing in some respects. There are workstay opportunities on people's farms. Gear follow up: Based on my experience over here, the latest generation Standard 4GF is by far best mat I've ever ridden. And pod PF2s are the most comfortable fins yet (for me). I had to add heel savers and flipper leashes, and they work great too. Now, I don't lose my fins, get no blisters, and the tall side rails allow riding the latest model Standard with high confidence in up to 6' or maybe 8' (but not barreling), at which point I might take out my 7'9" shortboard with a beefy leash, or more likely just won't go out. Oh, and my brother gave me a reversible O'neill neoprene surf shirt with nylon on one side and sort of rubbery traction fabric on the other side that grips 4GF canvas too well for shifting around on the mat in small surf, but provides high security in rough conditions. I never thought that so many people would be interested in something as esoteric as mat riding...stoked! Thank you so very much for the Fatty. I took out my watercam on it for the first time here in West Bali today. Attached my best ride (as the rest sucked due to technical difficulties learning the controls of the camera case). I'll send more vids when (and if) I progress. I like my new mat very much. "Today I hit the fabled "4th Gear" for the first time! The mat has always felt fast, but on one bigger set, the right hander looked like closing out, so I resisted the urge to straighten out, or pull out through the back. Instead I tried to be as neutral as possible, I loosened my grip on the front corners and wooosh.....it felt like an invisible hand had given me a gentle but powerful shove! The water passing under the mat was making a light fluttering sound and the Fatty seemed to know where it was going, holding an impossibly high line and shooting through the almost closing out section. I flew out onto the shoulder and with a subtle body roll I carved a smooth line back into the pocket. I was speechless! I paddled back out with a new confidence for approaching sections that looked unmake able. After four or five more of these, I started to get it dialled. I was lucky to have a peak where each wave was almost identical to the one before, so I could practise and refine my technique. I see now why people end up riding mats exclusively!!!!!"